Kebabs have long been a staple of the traditional undergraduate diet. So when the question of what a student on a limited budget could expect for decent and filling fare in Istanbul was posed to the Guardian, the answer seemed to be obvious. For if there is one thing you can get the former Ottoman capital, it is a amazingly good doner. Yet the article also pointed out some alternative culinary options for those of us who operate in a semi-permanent state of financial castration (read: backpackers and freelance journalists), but who aren’t so keen on limiting their diet to meat sheared from a rotating slab. One thing it failed to mention, however, was a Turkish meal unparalleled in terms of value-for-money and portion size. 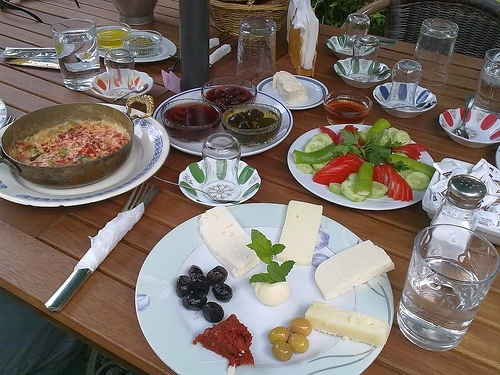 Breakfast in Istanbul, if you do it right, is to die for, and can be relatively cheap. Indeed, it isn’t impossible that your stomach will explode afterwards, if you eat as much as many people typically do at a sitting. The neighborhood of Besiktas has a particularly wholesome range of brekkie joints. Here, for well under 10 Turkish Lire — or USD$5 — you can enjoy a huge spread of local cheeses, honey, olives and traditionally prepared scrambled eggs (menemen), while black turkish tea (çay) and freshly baked bread are ferried to your table in waves by elderly waist-coated gentlemen. Bring an English/Turkish dictionary if you can. As it is not such a touristy area, being able to order in the native language will be an advantage, unless you are feeling experimental and don’t too much mind what you end up being served. Alternatively, if you’re looking for something a bit more familiar, scout around the area of Cihangir in Beyoğlu. It will be more expensive and a bit less authentic, but easily accessible from the commercial center and equally delicious. Wherever you go, order plenty of kaymak. If heaven was a dairy-based product delicately flavored with almonds, this clotted cream sumptuousness would be it. A restless Brit with big dreams and limited cash flow, Hannah is an English graduate and former Publicist who has spent the past 18 months living and working in Central America. You can follow her wanderings at TheTangerineRidiculousness.com.